What should Japan’s homes of the future look like? A few years ago, designer Kenya Hara posed that question to a group of Japanese architects and companies. 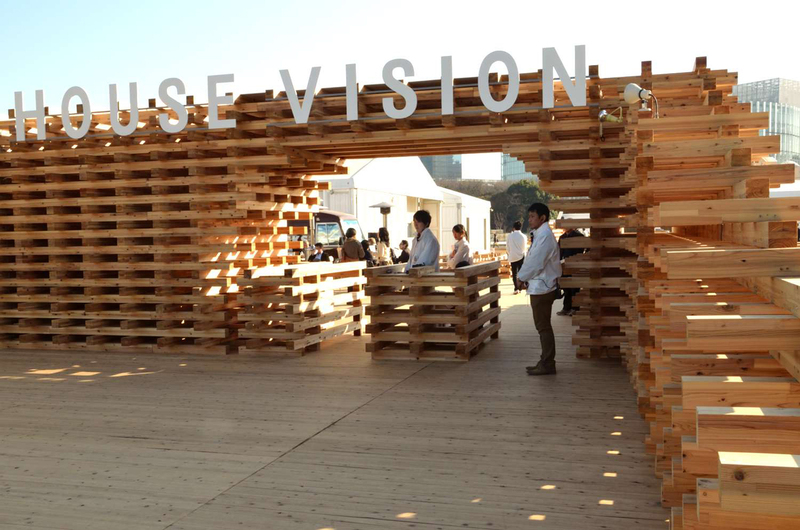 The result is the House Vision exhibition, open through March 24 in Tokyo. Toyo Ito, Shigeru Ban, and Sou Fujimoto were big names in architecture participating; a carmaker, a bookstore magnate, a forestry company, and other eclectic industries joined in, as well. Here’s what they had to share. Architect Kengo Kuma designed the exhibition, which includes a full-scale model house by each of six architect/corporate teams, plus one 1:5 model apartment complex (not pictured here). The grids of raw lumber lining the walkways will be dismantled and shipped to Fukushima after the show ends to be reused in a factory. Storage units like this one stand in as walls and structural support—no posts or beams needed. There are bookshelves, closets, and cabinets galore in the pared-down, boxy home. Legless kitchen island by Shigeru Ban, MUJI chairs by Naoto Fuksawa. Artist Hiroshi Sugimoto collaborated with Sumitomo Forestry on this elegant interior. “It’s traditional Japanese style but it’s also hyper-modern,” the artist said. “I’m an unlicensed architect,” Sugimoto joked on a tour through the model house. He designed the retro-modern chairs, too. The fence is made from bamboo brooms. Why? “They’re cheap and ready-made,” Sugimoto said. The “Edited House” was dreamed up by Tsutaya Books together with architects Masataka Baba, Atsumi Hayashi, and Hiroya Yoshizato from Tokyo R Real Estate. The idea is to let used-home buyers redesign their living space with maximum freedom. Residents would strip their condo or house down to its skeleton, then add new features from the real estate agent’s online “tool box” of choices. For instance, those who value their daily me-time might want to add a rolling study cubby like this one. Sou Fujimoto collaborated with Honda on this high-tech home that integrates energy generation systems with the living space and family car. Solar roof panels charge the batteries on this electric vehicle parked in the light-filled living room. Toyo Ito’s semi-outdoor space—a collaboration with building-material company LIXIL—lets in light and air but keeps out the rain. The glass box on the far right is airtight. That’s where the kitchen/dining area and bedroom are. Japan, birthplace of the Washlet, continues to forge new ground in toilet design. This one by architects Yuri Naruse and Jun Inokuma and toilet manufacturer TOTO smells like a conservatory greenhouse thanks to the living wallpaper and floor. Perfect for all those Tokyoites without an outdoor garden of their own?